Pizzas are an American staple. The most pizzas are ordered the night before Thanksgiving each year. Sometimes we want and easy, quick pizza fix. 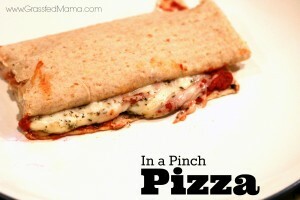 In a Pinch Quick Pizza is perfect for a quick lunch or even a heavier snack that will stay with you longer. You can easily just make it for one or make it for your family. I used Joseph Pita breads and lavash breads. These recipes would be easy to make extra of and freeze to have handy when you needed a In a Pinch Quick Pizza. Sometimes you run out of time and every one is hungry. This is the perfect quick throw together pizza. Spread cream cheese over pita breads. Mix tomato sauce: paste, broth, and seasonings. Spread sauce over cream cheese layer. What are your favorite quick pizza recipes? What a great quickie pizza recipe! My boyfriend could live off of pizza, but I try to limit it in our meal plans to 2x/month. This quick fix is perfect for him.. thank you! The Speedy Crust Pizza in the Trim Healthy Mama book is amazing and easy too! it is my favorite pizza to make. I really like this one with ricotta cheese too instead of the cream cheese. You could always cut them into bites for a great little snack. Monodiglycerides, Sucralose, Sodium Metabisulfite, Wheat & Soy …… EWWWW!!!! DO you know how bad Sucralose is for you??? Soy is not a food unless it is fermented! Wheat and Corn that are not organic are GMO! I am so glad you wrote this! Yes, we may eat this once every 2 months. 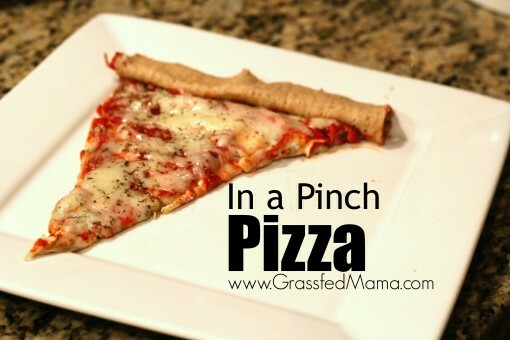 It really is a “in a pinch” kind of pizza for me. I know that the authors of Trim Healthy Mama have said that the Joseph’s low carb pitas and lavash breads are on plan. I still use them pretty sparingly. I did buy some to keep in my freezer for emergencies. But yes… the ingredients are not perfect at all. That’s what I love about the HighSteaks one listed (mine) – no need to look for tons of weird “ingredients” and stuff, it’s just egg, cheese, cream, and ACV – that’s it – and it only takes a few mins to make with zero kneading and crap like that. Yes!! I have a really easy recipe for coconut flour “tortillas” I also love just using lettuce. I adore these pizza ideas. Thank you so much for the link love!